Hang in there Get Well Care Package. 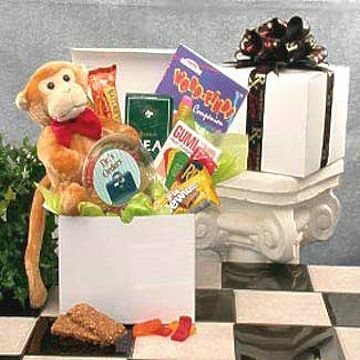 Send a fun gift to let them know you aren't monkeying around, you want them to get better soon. This gift includes the following: Hang in there plush monkey comes with green tea, Sunkist Fruit Gels, Get Well Gummi Aides, Fig Newton cookies, Healthy Traditions Granola Bars, Ritz Peanut Butter Crackers, and a Word Search Puzzle Book. Everything comes in a white gloss gift box packed with green tissue paper.